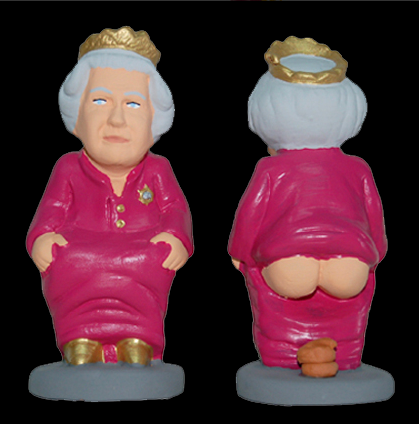 A ceramic figurine called 'caganer' of Britain's Queen Elizabeth, is seen on show at the Santa Llucia Fair on December 21, in Barcelona. Statuettes of well-known people defecating are a strong Christmas tradition in Catalonia, dating back to the 18th century. Catalonians hide caganers in Christmas Nativity scenes and invite friends to find them. Park at Mavell Road Trailhead. Travel West on Trail to Heritage Park/Concord Road Trailhead. Then travel back to Mavell Road. A scenic route and great family outing. Park at Floyd Road/Silver Comet Depot. Ride West to Powder Springs. Go left off Trail and have lunch at one of the restaurants in downtown Powder Springs. Look around the town, then return. Park at Floyd Road/Silver Comet Depot. Ride to Hiram Trailhead. Turn right on Seaboard Drive and go about 1/2mile to the shopping area. There are many restaurants, fast food and otherwise. Then return to Floyd Road. Park at Paulding County Chamber of Commerce. Ride West to Rockmart and end of trail in Rockmart. Stop in Rockmart for lunch at Frankie’s Restaurant, then return. Park at South Cobb Drive Trailhead. Travel to Rockmart, have lunch/dinner and return. o From Martin Trailhead travel West for 8.25 miles, to unmarked Hardin Road, just before the Esom Hill Trailhead. * From the end of the Chief Ladiga Trail in Weaver turn right and go approximately one mile. There are several motels and restaurants available at that point. * Repeat in reverse to return to South Cobb Drive! The goal is to be able to do the Full Monty!! Wahoo 106 miles each way!! Sample Exquisite Wines, See Amazing Animals, Enjoy the Aquarium and the Oceans Ballroom. The 2nd Annual “Aqua Vino - The Eight Million Gallon Bash” will take place on Friday, October 12, 2007 from 6:30 p.m. to 11:00 p.m. at Georgia Aquarium. Tickets for AquaVino are $125. Yours exclusively for one night, the marvel of the animals is sure to excite as you are treated to an epicurean extravaganza including the finest wines from all over the globe and gourmet fare from Wolfgang Puck Catering. Georgia Aquarium is a center of wonder and marine discovery for thousands of visitors each year; for veterinary students and faculty the Georgia Aquarium is an opportunity to study and perform pioneering maritime research. Proceeds from Aqua Vino support the Aquarium's state-of-the-art Veterinary Services facility and the Correll Center for Aquatic Animal Health. * Home - You can always get back to the front by clicking on the home tag or on the Dropzone.com logo. * Forums - With more than 1.2 million posts it's hands-down the most comprehensive skydiving discussion forums on the internet. * Gear - A gear database with reviews submitted by our members. Also a stolen gear database and an archive of gear documents. I have been interested in trying skydiving for about a year and a half and have been reading this site so I thought I would share. Cool off with a cocktail, enjoy fine cuisine and explore the life aquatic to the sounds of live jazz each Friday night this summer during Jazz Journeys at the Georgia Aquarium. World-renowned jazz musicians will perform sounds to calm the spirit and arouse the senses while guests enjoy some of nature’s most enchanting aquatic animals. Drinks and light cuisine will be available for purchase. The Aquarium will remain open until 10 p.m. each Friday night this summer through Aug. 31st with FREE jazz music starting at 7:30 p.m. in the lower atrium. This multi-faceted musician offers a refreshing style of jazz, letting his heart speak through his soprano saxophone. In his 30+ years as a saxophonist, he has shared the stage with such noted artists as Dizzy Gillespie, Clark Terry, Branford Marsalis, Al B. Sure and Oleta Adams. Atlanta's favorite smooth jazz guitarist blends gospel, blues and soul music with jazz for a sound that is uniquely informed by his southern upbringing. He’s had top 10 radio hits and 11 albums in a career that spans 18 years. Riveting, electrifying, sensational and personable describe the music of this renowned electric violinist. This 18-piece band has been playing together for 10 years. They offer an expanded repertoire of big band jazz tunes from the 1930s and 1940s, as well as more modern pop-jazz tunes from the 1990s. With a repertoire that ranges from straight-ahead jazz standards to spirited gospel and R&B, this artist returns to the Georgia Aquarium with smooth vocals from a variety of genres. A pianist, keyboardist and composer, this Atlanta-based musician blends jazz, fusion and funk. She has performed around the world and won several awards in her native country, Japan. Love the game? Now love the magnet set which has been adapted from the classic computer puzzle game that had us so addicted to conquering the never-ending stream of falling blocks back in the 1990s. These are cool. I think I will have to get a few sets. There are also sets of pillow tetris for small children (shown below) where they can build with them and then climb on it which is kinda interesting. A long time ago, far away on the planet of Cybertron, a war was being waged between the noble Autobots (led by the wise Optimus Prime) and the devious Decepticons (commanded by the dreaded Megatron) for control over the Allspark, a mystical talisman that would grant unlimited power to whoever possessed it. The Autobots managed to smuggle the Allspark off the planet, but Megatron blasted off in search of it. He eventually tracked it to the planet of Earth (circa 1850), but his reckless desire for power sent him right into the Arctic Ocean, and the sheer cold forced him into a paralyzed state. His body was later found by Captain Archibald Witwicky, and before going into a comatose state Megatron used the last of his energy to engrave a map, showing the location of the Allspark, into the Captain's glasses, and send a transmission to Cybertron. He is then carted away by the Captain's ship. A century later, Sam Witwicky, nicknamed Spike by his friends, buys his first car. To his shock, he discovers it to be Bumblebee, an Autobot in disguise who is to protect Spike, as he bears the Captain's glasses and the map carved on them. This movie fing rocks BIG!!!!!! You must see it in theater!!! It's easy to create your very own Phantom virtual fireworks show! Shoot fireworks over beautiful skylines including NYC, Miami, Louisville, Denver, Cleveland, Paris, France and more!